Beat together the egg whites and sugar in a bowl set over a pan of gently simmering water, till the mix forms a thick trail when the whisk is removed. Remove the bowl from the bain marie, and continue to whisk for about 2 minutes or until the mixture has cooled down significantly. Using 2 spoons, spoon 6 meringues onto parchment-lined baking trays, then bake at 100C/gas 1/4 for 1 hour 45 minutes. 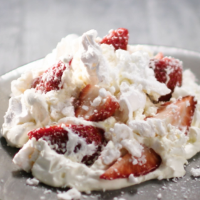 When cold, roughly crush the meringues, combine with the strawberries and cream, and pile in a bowl.